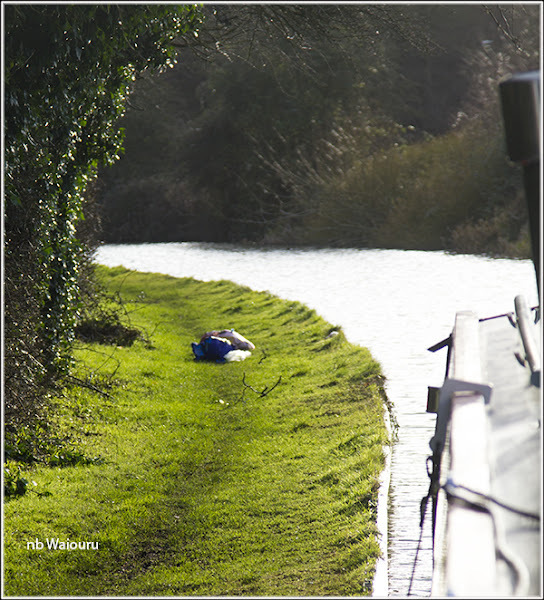 When we arrived at our current mooring in Milton Keynes there were two bags of rubbish ahead of us. We’re against a thorn hedge with a footpath on the other side of the hedge. Very few people are walking the muddy towpath and prefer to walk the sealed footpath on the other side of the hedge. My guess was this rubbish had been left by fishermen because boaters don’t leave rubbish. It gets tossed into the canal and then caught around your prop. We’re leaving today and I thought I’d do a Maffi by collecting the fisherman’s rubbish and dispose it responsibly. When I reach the bags it became obvious the rubbish hadn’t been left by someone fishing. It was obviously boaters rubbish and one bag contained used disposal nappies that had ripened nicely. <phew> The bag didn’t half stink! It’s now on the cabin roof at the bow where I only get small whiffs on the breeze. This is one bag I wouldn’t want to pull off my prop!